Initially, this tradition started by performing this dance form in front of Goddess Durga which represented a mock battle between demon Mahishasura and Goddess. Few stories also say that this dance form originated from ‘Raas Leela’ played by Krishna and Radha, therefore, the name Dandiya Raas! The word ‘Raas’ is derived from a Sanskrit word ‘Ras’ which means essence or expressions and Raas Leela meant playful dance performed in Mathura by Krishna. Dandiya dance is also named as “The Sword Dance” because earlier it was only performed by men, who used swords instead of sticks during the performance. Later on, even women started joining the celebration where they used bamboo sticks painted in colors like sticks. 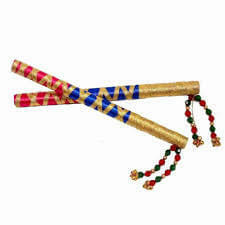 These sticks were eventually called Dandiya which represents the ‘swords of Durga’. During the dance, dancers energetically whirl and move their feet and arms in a well-synchronized manner to the rhythm of music with various beats. Percussion instruments such as Tabla, Dhol, Dholak, Bongos etc are played. The women wear traditional Gujarati dresses which are colorful. 3 pieces such as Embroidered and vibrant choli, ghagra and bandhani dupattas with mirror work and thread work is the attire. Heavy oxidized jewelry is chosen to complement with the dress whereas men wear special turbans and dhotis with short kurtas which this varies regionally. 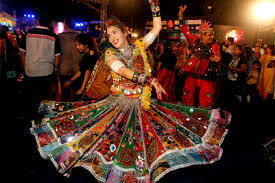 Dandiya is performed after worshipping Goddess Durga, as a part of merriment. This season of worshipping is called ‘Navratri’ where the Goddesses are worshipped for 9 Nights. It is a culture where women have fast for 9 nights to please the deity! After the rituals and prayers end, the celebration of Navratri begins. Men and women join in for Dandiya Raas. The drummer of the band plays various traditional songs and commands the beat and people form a circle in the open space to get started with Dandiya. The circular movements of Dandiya Raas with sticks are much more complex. 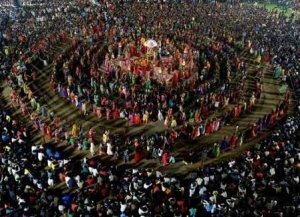 Today, Raas is not only an important part of Navratri in Gujarat, but extends itself to other festivals related to harvest and crops as well. The Mers of Saurashtra is noted to perform Raas with extreme energy and vigor. The performers strike the wooden sticks in rhythmic beats. People gather in two circular formations as mentioned earlier where the inner circle moves in a clockwise direction and the other circle moves in the opposite direction. With this formation, each person gets a chance to play with different partners. 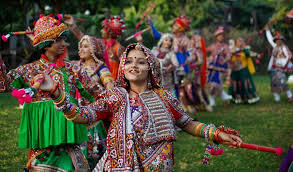 Various Dandiya choreographers are in high demand around the country since this festival is not just limited to Gujarat now but the entire nation enjoys the vibe. Almost 15-20 days prior to the season, workshops and seminars of this dance form are held in various cities where non-dancers and aspirants learn the authentic steps of Dandiya dance. These typical steps with pirouettes and jumps are very complicated but indeed energetic! The complete aura around is mesmerizing as all the communities come together and celebrate Navratri. Each one is enthusiastic to learn and perform dandiya steps to gain happiness and peace. Almost every playground, auditoriums and open spaces are filled with decorations for the evening where people gather and say the chants of ‘aarti’ and then begin with the 2-4 hours of enjoyment called Dandiya Raas!